There’s been a bit of progress in the Kitchen Garden area of our Hornsea garden. I’ve really missed my fabulous Kitchen Garden in Hessle – with it’s raised beds, greenhouse, fun garden sheds etc – but most of all, after having worked at creating then looking after a great Kitchen Garden for five years, and really getting into the swing of it with planning, planting, tending and then eating our own fresh produce, I’ve missed being involved. Remember the pictures of our old Kitchen Garden? Yes. That’s me in the corner! (Or is that the REM song?) 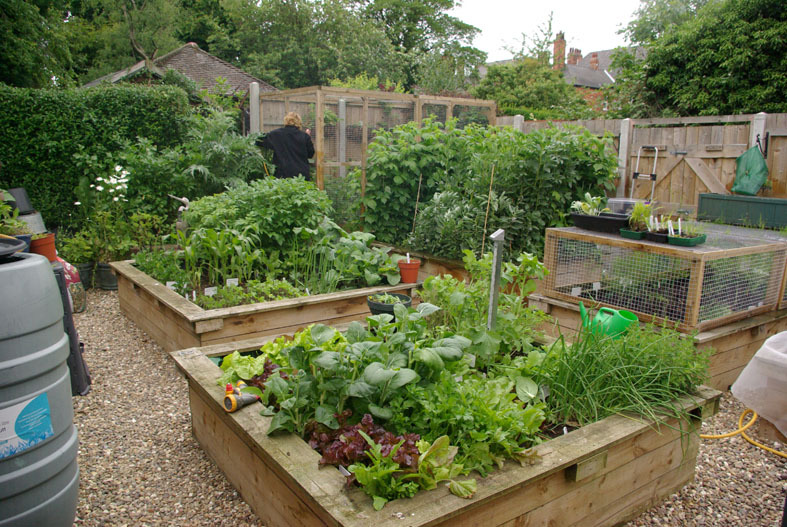 This was our Hessle Kitchen Garden overflowing with produce. Hope it’s going as well for the new owners. I’ve found a brilliant tool to help me plan my new Kitchen Garden in Hornsea. It’s Dobies Vegetable Garden planner, and it really will be a big help to me. This is what I will be working on in Autumn and Winter, when the East Coast weather is too foul for even me to venture out into the garden. Sitting at my computer, I will be able to plot and draw up a visual plan of my new Kitchen Garden, and it even allows for planting spring, summer and winter crops. In what is to be our area for fruit and vegetables, we have had to live with the garden for a few months, to see if it was a suitable space with enough sun and light for produce. We’ve hacked down ivy, trimmed all overhanging branches, taken down dead trees and suddenly the light is entering our Kitchen Garden tunnel. Thank goodness! So, what have we done. Well, for starters we have erected a fruit cage. On one of the hottest days of summer, Erik and myself set to, with rods and netting (not forgetting the instructions), and sweated and grumbled and argued (not too much) and after about two and a half hours, we had a fruit cage. Half way through, getting hotter. And ……. we have a fruit cage. Our fruit cage, in all its glory. 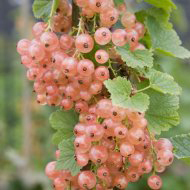 Just love these pinkcurrants – they are beautiful to look at, stunning as a delicate string of pink ‘pearls’ to decorate desserts, but the best bit is that they taste much sweeter than most currants. Gloire de Sablon is their name. So, we have a fruit cage. What’s it for? For protection from the birds, the pigeons, the seagulls and the squirrels. It will be a home for raspberries, berries of all descriptions, such as redcurrants, pinkcurrants, whitecurrants, blueberries (and with a new, pink blueberry (? 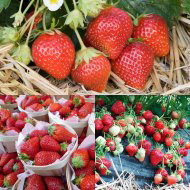 ), my favourite French strawberries – (Manille, Garriguette and Mara des Bois), and red and savoy cabbages, which are usually decimated by pigeons. So next year, can you imagine the fabulous desserts we will have to eat, using our own fruits. 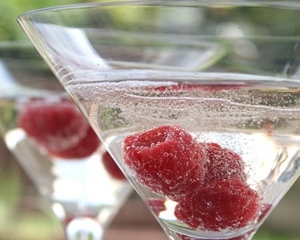 The sorbets, the icecreams, the gateaux, shortcakes, fruit salads, but to celebrate our blog returning to normal, and the beginnings of our Kitchen Garden, this Raspberry Prosecco is one I will celebrate with first. Hi from a very old friend. Have looked at your blog for the very first time and just love it. Remember so well the Kitchen Emporium and the fun we had. I am still using many of my purchases. Will now follow your adventures on a regular basis.You have inspired me! Lovely to talk to you the other night and catch up. Glad you like the blog – enjoy writing about everything, but last year there wasn’t too much fun stuff to write about. This year is hopefully renovating the house, building the extension, planning a new Kitchen Garden and flower garden, planning a new Kitchen (heaven to me) and planning a patio and outdoor kitchen. That should keep me busy and give me a great deal to write about. Don’t forget to ring or email me so that we can meet up and put the world to right. Love to all the family, Astrid.